There are few celebrity couples that sparkle as brightly as Mark Consuelos and Kelly Ripa. Whether they’re together on her morning show or on BFF Andy Cohen’s Watch What Happens Live their teeth shine white, their tans are deep and dark and they seem truly blissful. 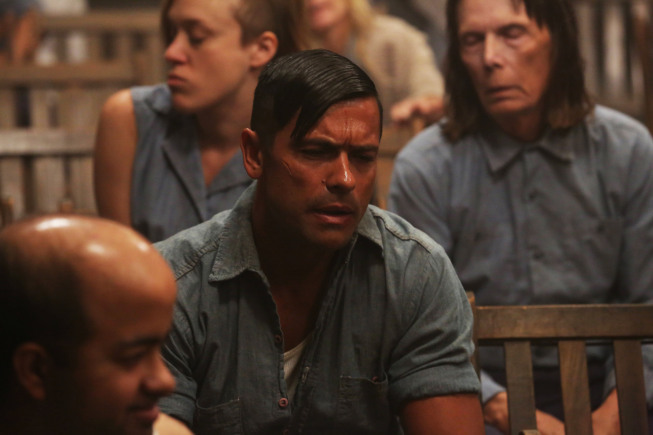 So to witness Mark take on the super-dark role of Spivey on American Horror Story: Asylum has been a sight to behold. With messed up teeth, a less than perfect coif and a badder than bad demeanor, the former All My Children star is undergoing a storyline far more complicated than evil twins. In a recent conference call interview, Mark talked about his edgy turn in Ryan Murphy’s madhouse. After all, even with all the plot twists that occur in daytime TV, Consuelos is thought off as a handsome leading man. So to be able to transform into a lunatic and then in true AHS fashion into a creature, was a great opportunity for the actor to break away from the stereotype. Tune in to see the coolest dad on TV when American Horror Story: Asylum airs on Wednesday nights at 10 p.m. EST/9 p.m. Central on FX to see what’s in store.